This is another part of my series on favorite songs. I’m covering the Hymns first and then going into other songs. 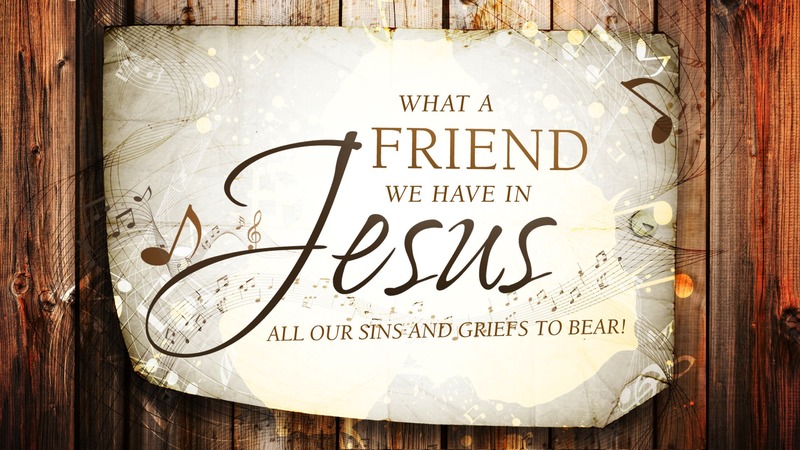 I have listened and sung ‘What a Friend We Have in Jesus” since I was very small. And have always loved it. Even though I have to say that for a long time it was just a song I sang at church. The words didn’t really mean alot to me until I was driving down the road and I was alone in my car. I was having a rough time and not in a good place emotionally or physically. I was tired of Dr’s and life in general. I was feeling like God forgot I was here and that all the things going on in my life was for nothing. I was in a pretty dark place on this particular day. I prayed out loud as the radio was playing in my car. Really it was more of a frustration and I raised my hands in the air and wondered what in the world was God thinking. I was tired and not wanting to deal with anything more on my plate. At that moment, the song, “What a Friend We Have in Jesus”, started playing on the radio. I had to pull off to the side of the road and was bawling by this time. I was so overwhelmed with emotions and peace that I couldn’t drive. While doing this blog post, I have been listening to different versions on youtube and what an awesome reminder and feeling knowing that Jesus is the most loyal and best friend I could ever have. At that moment the words I heard many times and even hundreds of times became real to me. I seen Jesus in a different light. It was at that point when my prayers became more like conversations and I realized that not only was Jesus my Savior, He is my friend. I have never taken for granted the song since this. It was a answer to my prayers at a time when I needed it.If your having a really hard day or just the reassurance that Jesus loves you and He is there, it may be a good time to listen to this song. And listen with your heart.